I spotted an announcement about Brannland ice cider and asked for a sample because as a Southern Canadian gal, I know Ice Cider and consider it uniquely Canadian. This company was not Canadian and I thought it interesting and unique. 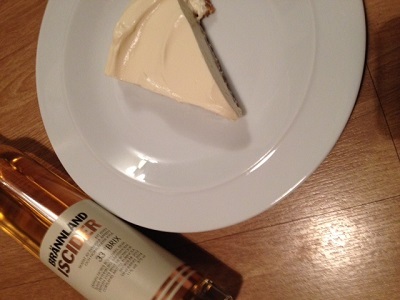 The Brannland Ice Cider does have a slightly different flavour to the Canadian Ice Cider I’m used to. Where the Canadian version seems to have more of a tang which I often associate with Spartan apples and other similar tight flesh apples, this reminded me of different apples with a slightly less sweet tang and a bit more grainy fleshed apples. It was slightly fizzy which was a bit of a surprise but it worked for it. Not carbonated, just a light sparkle on the tongue. Less sharp and less sweet than a Canadian Ice Cider but really nice. Using a food processor, blitz together the biscuits and butter until it looks and feels like a wet sand or crush the biscuits and blend in the butter. Press the mixture in a 25cm spingform pan until it covers the whole bottom and possibly a bit up the side and place in the fridge to cool and firm up a bit before adding the mix. In a separate bowl, blend together the cream cheese, sugar, ice cider and vanilla. In another bowl (yes, I know, we’re up to 3 bowls now) lightly whip the cream until it thickens a bit. Don’t put too much air in it, it has to be firm. Mix together the boozy cream cheese mixture and the whipped double cream until they’re completely combined. 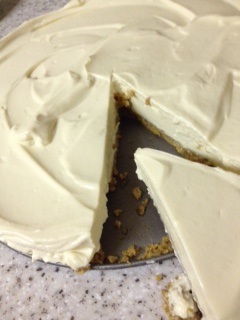 After the cheesecake has set, serve it plain or with chopped apples on top or perhaps a biscuit on top. Looks like a realy interesting recipe. I think I’ll be trying this the next time I’m entertaining guests! Thank you!